Atlantic Towers was founded in the early 80s, by Steve Tull. Steve was working for Cape Island Yacht Sales as a Vice President responsible for Operations when his boss decided to sell the business. Steve took the opportunity to step out on his own. The concept of “Tuna Towers” was just coming into vogue and Steve with his background as a mechanical engineer and charter captain founded Atlantic Towers® in a small leased marina on Long Island. The economy was strong and the business grew rapidly. Within a few years Atlantic Towers® was the OEM tower vendor for such notable Sport Fishing brands as Boston Whaler, Rampage, Blackwatch and others. In 1988 Steve was joined by Shelley Golden, who took over the marketing and sales function. Shelley after managing the Atlantic Towers’ exhibits at 100s of Boat Shows has become known as the “Tower Lady”. The Company survived the 1990 -1991 recession, and the ill conceived Federal Luxury tax on recreational boats. With it’s OEM customers shuttered the Company focused on individual customers in the aftermarket. In the early 2000s, the Company developed it’s proprietary extrusions and the technique for building Custom Hardtops as a composite aluminum/fiberglass structure. Typically one third the weight and less than one half the cost of traditional cored fiberglass retrofit hardtops. 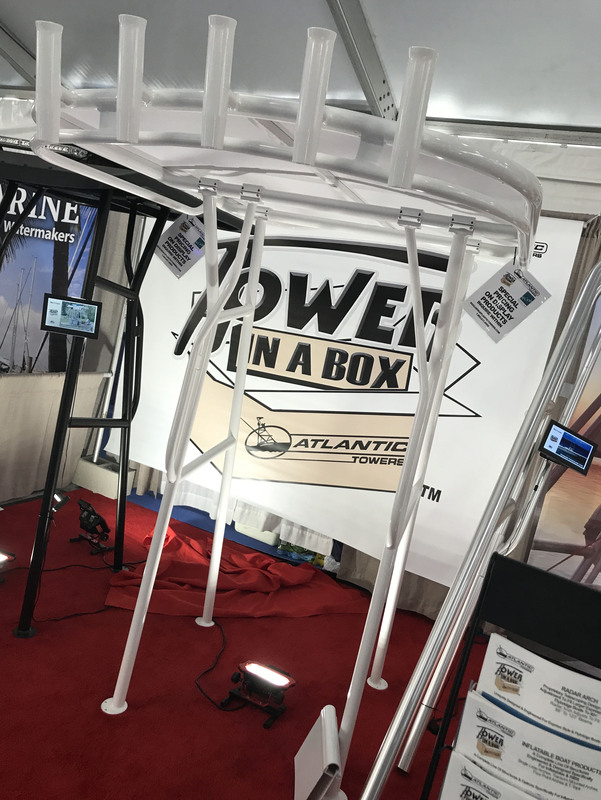 In the mid 2000s, the Company produced it’s first Tower in a Box® product, the Trampoline T-top which was introduced to great success at the Norwalk Boat Show with several hundred units sold in the first year. Copied by many including clones made in China. The original Trampoline T-top is still the highest quality universal fit T-top on the market. The Tower in a Box® product line has propelled the Company’s growth for the past several years. Tower in a Box® has defined the concept of the high quality universal fit boat tower structures, now with over 30 standard products, and because of the interchangeability of components, literally hundreds of Configurations are possible. Today, Atlantic Towers® custom structures and Tower in a Box® universal fit structures are the highest quality and most extensive unique designs in the industry. Arguably the most recognized brand for marine tower products in the world today is Atlantic Towers®. 10s of thousands of structures bearing the Atlantic Towers® logo have been produced in 30+ years, most of which are still in service today. You can see Atlantic Towers® structures in service in virtually every Great Lakes or Coastal Port. Shelley Golden, (shareholder and sales executive) firmly established the Atlantic Towers® Brand by traveling to and displaying product at over 20 boat shows each year from the mid 90s to the mid 2000s. Today, the library of technical information on thousands of boat brands and models curated over the Company’s 35 year history allows the production of Atlantic Towers® Custom structures for shipment anywhere in the world without setting foot on the customer’s boat. The first of the current design family of Tower in a Box® products was the “Trampoline T-top”. This is a simple and elegant design which required no drilling for assembly. Instead a “vice-like” clamp manufactured from one of the Company’s proprietary extrusions, attached legs to top frame. The only tool required for assembly is an allen wrench, and as no holes are drilled the position of the legs can be changed easily during the installation process making fatal DIY installation errors nearly impossible. Tower in a Box® products encompasses seven T-top models, with three top material options, Sunbrella® fabric, polycarbonate plastic and fiberglass, plus multiple supporting leg options. The original Tower in a Box® T-top has been joined by the “Walkaround Tee”; “Suntop”;and “Sport Tower”. Additionally the line includes seven arch products which are fully adjustable, “Fishing Arch”; “Radar Arch”; “Sail Arch”; “Super Sail Arch”; “Pontoon Arch” and a transom mounted arch for small inflatables. Tower in a Box® structures are supported by a full line of proprietary clamp on/bolt on accessories including antenna mounts, radar mounts, electronics box mounts, adjustable rod holders, solar panel mounts, wind generator mounts, navigation lights, LED deck lamps to name a few. Development of new Tower in a Box® products and accessories is an ongoing process at the Company. Watch for Product Introductions and at the Miami Boat Show, the International Boat Builders Expo, and the Marine Equipment Trade Show in Amsterdam.